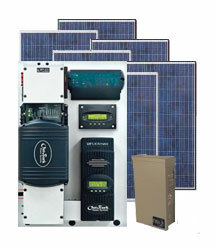 This expandable 3,060 watt off-grid system has a pre-wired power center that makes it easy to install. The OutBack Flexpower is pre-wired with all of the essential protective devices in the smallest possible space at the lowest installed cost making it ideal for applications with modest power requirements such as cabins, weekend get-a-way homes, and remote communication sites as well as back-up power systems homes. Utilizing an extremely compact design and an easy-to-install mounting bracket, the fully pre-wired and tested Flexpower ONE System is engineered for a quick installation, saving both time and money. The pre-wired power center comes with an OutBack charge controller already mounted. OutBack charge controllers have maximum power point tracking with an efficient, safe, multi-stage recharging process that prolongs battery life and assures peak performance from the 3,060 Watt solar array. With a 48v battery bank the FM80 charge controller can take up to 4,800w of solar power, however because we need to keep the series strings of panels in sets of three panels ( due to the Max Voc input of 150V to the charge controller) a total of 18 x 255w solar panels can be used with the FM80 charge controller. Flexpower by Outback includes a single AC inverter, AC and DC wiring boxes, a single Flexmax battery charge controller, MATE monitor, HUB, Flexnet DC and lighting surge protector. All this wrapped up in a 3,060w off-grid kit with a small power center footprint. The Flexpower System is also equipped with battery and breakers, a GFDI breaker, an input-output-bypass assembly, mounting locations for both AC GFCI Type B and EU Type F style outlets and additional AC breakers. This expandable system has 25 year guaranteed UL listed solar panels, UL listed combiner box and we supply all the connectors from the panel to the box. You supply the conduit and wire from the box to the power center which is indoor rated. The 3,060 watt Off grid system is the only choice when you need a fully integrated off-grid system with pure sine wave inverter all pre-wired ready for you to add your own rack or select one of ours. With this pre-wired system you can save yourself thousands of dollars over the cost of hiring a contractor to install your system. Flexnet DC and surge protector for 120V 60Hz applications. FLEXpower™ ONE FP1-GVFX3524 & FP1-GVFX3648 inverters are designed to work off-grid and also interact with the grid to back feed power. If you have a generator you should be aware that the GVFX3648 inverters will only sync with Honda EU generators because they produce pure sine wave power. If you intend to use your system completely off grid (No Grid Tie Ever), you may want to have us switch to the VFX3648 inverters for your FLEXpower™ ONE system at no additional charge to you because the VFX3648 will interface with a wider variety of generators. Should you choose to make that change, just notify us in the comment box at the time of checkout. Some additional items sourced from your local hardware store that you may need to purchase are: Conduit, appropriately sized electrical wire from the combiner box to the location of the power panel, some fasteners, sealant, grounding rod and wire to complete the final connection to your main panel or sub panel.